In 2006 a Special Airworthiness Information Bulletin was distributed regarding potential hazards of mounting FLIR systems on Rotorcraft. (SW-06-068) FAA concerns and subsequent policy changes have been implemented regarding the safety of Airborne Laser Scanners on Rotorcraft because of the potential hazard. The policy identifies concerns with Class 3A, 3B and 4 lasers. The proposed policy directs that these lasers not be approved in an operational configuration; the laser function must be electrically disabled and a Class 1 Rating mandatory. Riegl Laser Measurement Systems GmbH has released its latest state-of-the-art Airborne Laser Scanner the LMS-Q680i – Class 1 for FAA Rotorcraft. The scanner will use reduced laser power to achieve the important Class 1 rating the FAA policy dictates. The risk for a person in the area around the LMS-Q680i – Class 1 scanner is zero. The new system is available for order in North America immediately. “We are excited to be able to quickly respond to the Geospatial communities need to be in accordance with the FAA regulations,” said Riegl USA President, James Van Rens. 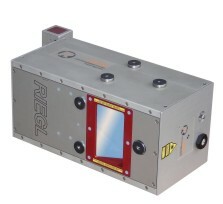 For more information please contact info@rieglusa.com.